The spread of Islam is not a new phenomenon. Ever since Muhammad's troops fanned out from Mecca in the 7th century, Islam has been spreading globally. But Islam's spread in Western democracies is a recent trend and one that is accelerating. 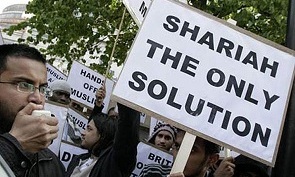 This spread of Islam in Western democracies is led by the Muslim Brotherhood and other Islamic groups that endeavor to maximize the spread of Sharia law and Islam in the targeted societies while minimizing detection and push-back. This is achieved through the five phases of IRICI: Incubation, Recognition, Infiltration, Confrontation, Imposition. When the first Muslims arrive in a Western democracy, they keep a low profile and make few if any demands on the host nation. Many quietly work as shop keepers, students, teachers, professors, doctors and other professionals, making good first impressions and gaining vocational respect. When a sufficient number of Muslims gather, they request recognition of the Sharia law being applied within their own community. To preempt resistance and suspicions, they publicly condemn "radical" Islam and even seek well-publicized inter-faith dialogue and gatherings. They position Islam as a religion of peace whose Sharia law isn't a threat to the host nation since it would never be applied outside the Muslim community. Often, they are supported by the host nation's naive leaders who wish to be seen as "progressive." When Muslims gain critical mass in a few cities, they begin to infiltrate key institutions of the host society. They create an alphabet soup of front and umbrella organizations that inflate their size, and use them to lobby the government, support (pro-)Muslim political candidates, conduct public relations campaigns, file lawsuits against alleged Islamophobia, place imams as 'chaplains' in armed forces and prisons, endow Islamic studies departments at universities, and pressure public schools with Muslim students to pray towards Mecca. When Muslims become a significant minority in the host country, they demand incorporating into its legal system elements of the Sharia law. 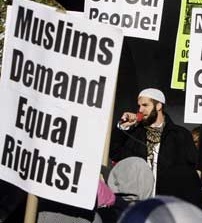 Often, this demand is made while "rogue" elements of the Muslim community threaten or engage in violence (see Muslim refugees in Europe and UK). When the Muslim population becomes the majority and/or Islam gains control of a region, Sharia law is imposed across the region, which is then locked down against non-Islamic influences, including the Gospel. The ideal Islamic state is Saudi Arabia, where Sharia law is the only official law and enforced with barbaric brutality.